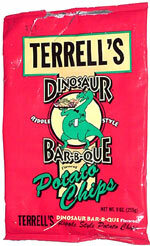 Taste test: These just might be the best barbecue chips I've ever had. Whereas most barbecue chips taste like barbecue powder, these actually taste like barbecue sauce, right off the meat. It's a nice, sweet taste, with a small bit of kick to it too. The chips have narrow ripples, are darkish in color and have good crunch. Yum! This is a truly great snack. From the package: “Visit Dinosaur Bar-B-Que Genuine Honky-tonk Rib Joint - Syracuse - Rochester” ... Ingredients include brown sugar and molasses. 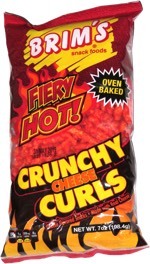 This snack was discovered by Patti in Syracuse.